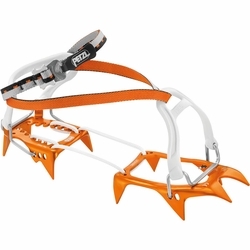 Petzl LEOPARD Crampon. Ultra light crampon with LEVERLOCK FIL binding or FLEXLOCK binding, for ski touring and snow travel. NB: it is essential to test crampons with the footwear on which they will be used, to ensure compatibility.